Since moving back to my parents’ house I’ve tried not to change too many of my routines to keep a bit of normality in my life amidst all the changes. One thing I’ve been determined to do is keep my health and fitness regime ongoing as I know how much better it makes me feel when I go to the gym, and how much worse it makes me feel when I get into bad eating habits (daily packets of Daim Cadbury Eggs I’m looking at you). Even though most mornings I’d rather be staying cocooned in my quilt than getting up and going to the gym, I’ve kept up my personal training appointments and also tried to fit in a few runs as the post-exercise endorphins really give me a boost. Here is a totally narcissistic blurry phone photo in my gym socks from before I went to the gym a couple of weeks ago, because why not? I’ve actually got out of some of my better habits and put on a few lbs since after Christmas so I’m determined to up my training and nail my eating habits to get to where I want to be. I was away with work last week and found myself ordering room service and drinking more wine than I usually do but I’ve accepted that things aren’t always easy to control and to be kind to myself and just go with the flow. Although I’ve got out of the habit of tracking on MyFitnessPal, one thing I always fell down on is not eating enough protein. I’m not naturally a great meat eater and most of the foods I’m naturally drawn to (hi there bread and potatoes) are not very protein dense. Because I’ve been focussing on building muscle in training, protein is important for building lean body mass and so it’s not really ideal to be lifting weights and surviving on toast (more’s the pity). For that reason I tend to have a protein shake after the gym or with a meal if it’s one without much protein in it. 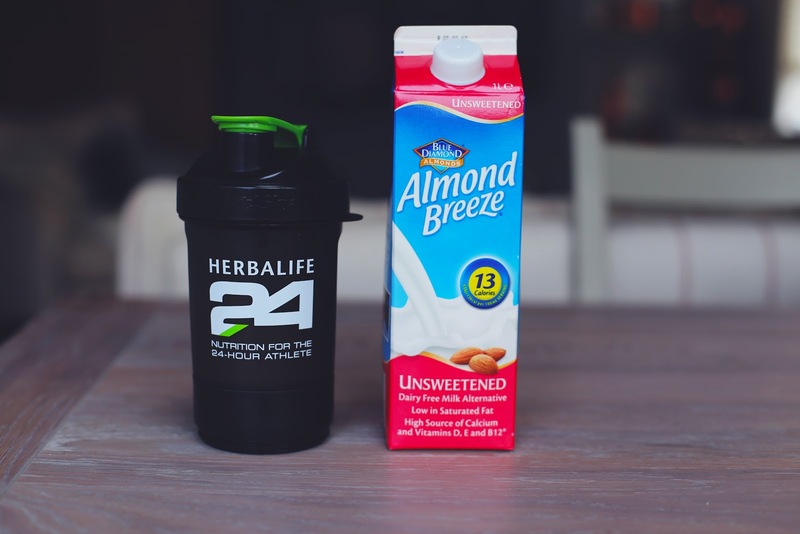 For the last few weeks I’ve been trying out the Herbalife Formula 1 Sport which is a protein shake which can also be used as a meal replacement shake. I’m not an advocate of meal replacement shakes or anything that suggests swapping out meals, but as it has 18g of protein it’s an easy way to get a hit of protein after a workout without having to eat a load of chicken! I have it with almond milk or cashew milk (cashew milk is SO nice) and the vanilla flavour is really yummy, I’d definitely recommend it. 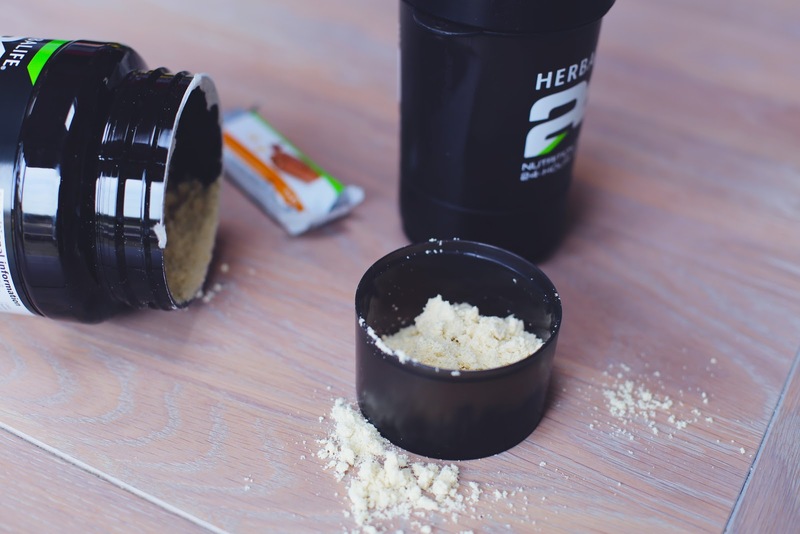 I don’t think you can actually buy Herbalife ‘off the shelf’ but if you go on their website you can fill in a form and get one of their reps to contact you who can help you select the products that are right for you. I also tried out their protein bars which are absolutely lush. They’re another product that are perfect for after the gym or as a mid-morning snack – they’re only 140 calories per bar and have 10g of protein. I’m definitely going to find a way to re-buy them as I finished the box really quickly and I’m going to miss them in my gym bag over the coming weeks! I’m really focussed on keeping to my plans over the next few weeks (whilst allowing a bit of balance too of course). I’ve found a yoga class near me that I really like, I want to run a couple of times a week and also carry on with my personal training. I went swimming last week which I really enjoyed and I’d like to find a nice pool near me that I can swim at before work but I’m quite particular about the cleanliness of the changing rooms – what a snob! Still, it was a good excuse to stock up on some cute mini shower gels and get a new washbag – especially as I had some money off vouchers for Boots!